You must be a member of the Calgary Outdoor Group to attend this activity. Would you like to join this group? The Great Divide Trail is Canada's most beautiful long trail. From the US border in Waterton Lakes National Parks, the trail follows the continental divide along the BC & Alberta border and ends in Kakwa Provincial Park. 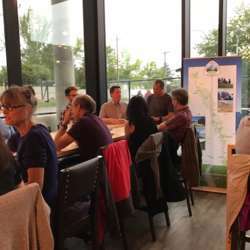 The Great Divide Trail Association is hosting a pub night, a casual event with a mixed bag of people, from vetran thru-hikers to to those wanting to get out on the trail.